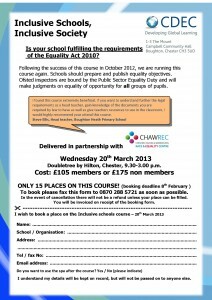 Disability in Schools March 2013 Flyer, click for PDF. Although in practice many disabled children will have Special Educational Needs (SEN) identified and as a consequence may be receiving support, this will not be true of all children. Just because a child has SEN or has a statement does not take away a school’s duty to make reasonable adjustments for them. In practice many children who have a statement of SEN will receive all the support they need through the framework and there will be nothing more that the school has to do. However some disabled pupils may not have SEN and some who have will need additional reasonable adjustments. A disabled pupil with ME finds moving around a large three storey secondary school very tiring and despite the school adjusting the timetable and loaction of classes to minimise the amount she has to move she is still too exhausted to complete the school day. The school then makes further adjustments of having a ‘buddy’ to carry her books for her, a dictaphone to record those lessons that she misses and a policy that she will not be penalised for arriving at lessons late. These adjustments enable her to attend more lessons and to be less disadvantaged when she does miss lessons. An infant school disabled pupil with ADHD receives some individual teaching assistant support through the SEN framework. He is diagnosed with severe asthma and needs assistance with his nebuliser. Although this is not a special educational need, his asthma is likely to be a disability for the purposes of the Act and so a failure to provide a reasonable adjustment will place him at a substantial disadvantage. The school trains up his teaching assistant and she provides him with the assistance he needs. Schools who are interested in their responsibilities under the Equality Act can contact us to to book a place on our next training session in conjunction with Cheshire Development Education Centre on the 20th March. This entry was posted in Casework, Disability, Discrimination, Education, Equality Act, Schools by admin. Bookmark the permalink.